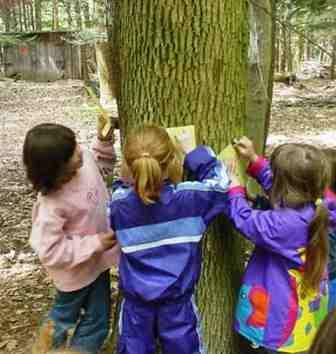 Adopt A Tree was created in 2002 by Pfeiffer Nature Center volunteers as a venue to provide nature-based environmental education; to cultivate the next generation of earth stewards; and to meet our mission of creating opportunities where science, art and nature come together. Volunteers marked off two acres of forest on Lillibridge Road in Portville, NY to create an outdoor living museum. These two acres encompass one of the few remaining stands of accessible old-growth northern hardwood forest in the eastern United States. Each tree in the Adopt a Tree forest is jointly sponsored by businesses and individuals. These supporters recognize the importance of Pfeiffer Nature Center visitors participating in meaningful ways to learn about old-growth forest habitat and ecosystems through science, art, and language skills. Participants of workshops learn about Adopt A Tree conducted at the Nature Center’s Outdoor Learning Laboratory on Lillibridge Road. Each year, the Nature Center staff and volunteers design a fun, interactive learning adventure focusing on current environmental issues that affect our community. To date, thousands have visited this beautiful spot to learn about the old-growth forest ecosystem and have developed an appreciation of the value in conserving these precious resources. For more information on the Adopt A Tree Program, please contact us.